UPDATE: As a reminder, there will be no VTA bus service from the Warms Springs BART Station to San Jose . The following VTA bus lines will continue to run from the Fremont BART Station for most of this year: Express Bus Lines 120, 140, 180, or 181. Once VTA’s BART Silicon Valley Extension (10-miles, two stations) opens for passenger service, VTA’s Express Lines 120, 140, 180, and 181 are slated to be discontinued under VTA’s Transit Redesign Draft Plan (nextnetwork.vta.org) since they will overlap BART service. At that time, BART passengers can access VTA at the Milpitas BART Station in Milpitas or the Berryessa BART Station in San Jose. Paving the way for BART service to Santa Clara County, the BART Warm Springs Extension is set to open for passenger service Saturday, March 25. The 5.4-mile extension connects the existing Fremont Station to the new Warm Springs/South Fremont Station. BART service will run to Milpitas and San Jose when VTA's Silicon Valley Extension opens later this year. One day before beginning service, BART will host an Opening Celebration. From 10 a.m. until noon on Friday, March 24, BART will welcome neighbors, elected leaders and anyone interested in the new station. On the day of the celebration, free shuttles will run from Fremont Station to the new station every 15-20 minutes from 8:45 am to 1 pm. 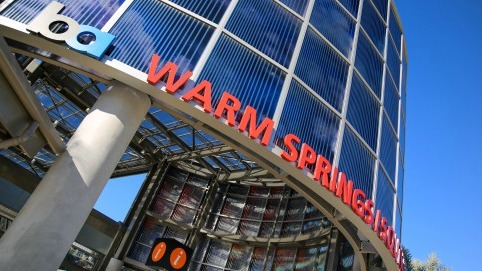 The station is located at 45193 Warm Springs Blvd.